11.1 Your account has been suspended. 11.2 Logon Failed: You have been banned from our games. 11.3 This computer has been tainted. 11.5 How to appeal a ban? If at any time the attacking flag is not putting up sufficient fight, as determined by the Oceanmaster on duty, we will consider that as their flag's consent to end the blockade early. Please note: Blockades cannot be closed before they begin. Any modification to a running blockade is at the discretion of the on-duty Ocean Master. Blockades will not be closed in favor of an attacker. We may give you a partial refund for any stolen items, however, we encourage you to seek out the thief, point out this thread and try to get the full amount back on your own. To give us the best chance to help you, please submit a complaint within 7 days of the theft. Grey Havens does not recognize loans and deals with terms outside of the in-game trading methods. Once something is exchanged via. a trade, /tip or /pay, the recipient is under no obligation to return it to you. While we will investigate claims of wrongdoing in such cases, we make no promises or guarantees as to what will be done or returned. As with other forms of stealing, anyone caught scamming or otherwise cheating someone else out of their poe may be permanently banned from the game. Bazaars may be dusted if they are empty and all shoppes of that type have also been dusted on the island. Construction Sites may be dusted when requested through a petition. Note that we will not be refunding commodities on construction sites that have been started unless it's clear the wrong shoppe type was placed by mistake. Islands where the fort or palace has gone dark may be taken by a BK at any time, although typically this will happen some time in the last week before they dust. Islands will not be returned once taken, they will have to be won in a blockade. Pets follow the same guidelines as pirate names, inappropriate or offensive named pets may be confiscated or result in a ban. Pet names will not be reset. 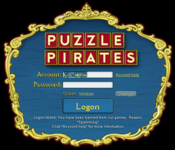 The age requirement for playing Puzzle Pirates is thirteen and up. Anyone playing the game who is confirmed to be underage will have their account suspended until they are old enough to play. If we can verify that it was caused by a bug or other failure on our part, we will restore the sunken vessel. Immediately submit a bug report in the game with the /bug command. Explain in as much detail exactly what happened. Submit a single petition including the ship name, owner of the ship and a description of what happened. Please make sure that you submit a bug report immediately after you experience the problem, without these we cannot verify sinking claims or investigate/fix any bugs which might be causing unwarranted sinkings. We will do our best to get back to you as soon as possible, please be patient as it can take a few days to investigate. Please note that we will restore a sunken vessel by unbottling the same vessel that was sunk. In order to ensure a timely resolution please keep the bottled vessel on the owner's pirate. The number of shoppes that can be placed on Classic oceans in a week is two to slow the rate of development of an island. Note that this does not apply to bazaars and other government buildings! A week is the time between Saturday noon to the next Saturday noon. Essentially you can plot two shoppes at any time during one week, it doesn't matter if they're both at the very beginning or the very end. This limit does not apply to Dark Seas. Building names are one of the more noticeable items in the game, and as a result we have decided that we would like to try and encourage those names to be interesting. We have put together a set of rules for building names to follow, trying to keep them fairly flexible. Building name should be sufficiently different from others on that island so pirates can tell the difference between them. Disclaimer: Some building name cases may be clear, and others may be borderline. In each case, we will endeavor to apply these rules consistently and without bias. We will amend or clarify the policy if required. If you own a building that does not follow the above criteria you will be contacted to request a new name or to give further clarification on why your name fits (a cultural reference which was missed, for example.) If a suitable name is not provided, the building will be renamed to something appropriate to the theme of the island. A ban is a block placed on an account to prevent it from being logged into, typically as a result of violations to the Terms of Service but may be used for other reasons to prevent access to an account. Bans are permanent unless removed by an Ocean Master. Login screen for suspended players. What does this mean? A suspension is a warning that something you have done in the game is not acceptable, but not to a degree that warrants a full ban. Continuing that action will cause further suspensions or potentially a permanent ban from the game. How long is my suspension? The length of your suspension is listed on your game window in the form of "You must wait X days before you may re-enter the game". Times are listed in hours or days and are rounded down. Suspensions end at 12:01am Pirate Time (PST) on the day when they are set to end. Why was I suspended? Before returning from your suspension you must agree to a statement, this statement is listed in quotes and will tell you what you did wrong. How can I play again? Once the suspension time is up the dialog box will turn white and accept text. Type the statement indicated (making sure it is exact!) and push the "accept" button and you will be able to return to the game and play. Do not log into another account until the suspension on this account has run out. How long do suspensions usually last? Typically anywhere from 0 days (you can log in immediately) to 7 days long. Logon Failed: You have been banned from our games. Login screen for permanently banned players. What does this mean? A ban means that you have been blocked permanently from the game and won't be able to log in. Why was I banned? After the message indicating that you have been banned there will be a note from an Oceanmaster indicating why your account was banned. See the Ban Reasons section below for additional information. How long is a ban? Bans are permanent, they do not expire. How can I play again? If your account was compromised, if the ban note indicates you should contact us or if you believe your account was banned in error, please send a message to "Banned Accounts" using the support form. If your account was banned for a TOS violation, DO NOT log into the game, this is called "Ban Evasion" and may reduce your chances of successfully appealing a ban on your account. This computer has been tainted. Tainted computer attempting to create new accounts. What does this mean? A taint means that an account that was accessed from your computer has been banned. A taint prevents you from creating new accounts from your computer but does not affect any other active accounts that you are currently using. How long is a taint? Taints are permanent, they do not expire. A list of all accounts that have been accessed from your computer. The name of the account you are trying to log into when you get the taint message. The following gives more information about ban reasons. Account Theft: You were either directly responsible for or very closely related to someone who was responsible for stealing an account. Ban Evasion: means that we found evidence that you were previously banned on another account. Sometimes that account will be specified in the ban reason. Billing: There is a billing problem of some sort which we may need to resolve with you before you can access your account. Please contact our Billing Support through the support form if indicated by the ban message. Cheating: This includes cheating or misrepresenting your skill at a wagered game, advertising a website with cheats or exploiting a bug for your own profit. Compromised: This means that we believe someone has stolen your account and you should contact us through the support form to verify ownership of the account so we can return it to you. We are only able to verify ownership if there has been a purchase made on this account. Hacking: is the modification of game files or the use of any sort of software or hardware to gain an advantage in the game. Language: Using vulgar, obscene, or offensive language, including racial, sexual, or religious slurs. Misspelling or mis-spacing words to get around the filter will be treated as swearing. Scamming: is when someone tries to trick another person into giving away their pieces of eight, doubloons, items or account information. Speedhacking: is a specific type of hacking, this is the use of software or hardware aids to increase the speed of play on any puzzle to gain an advantage. Theft is when something is taken from another pirate without their permission. Most thefts are the result of pieces of eight or items being taken from a ship, house, stall or shoppe. How to appeal a ban? The only way to appeal a ban is if the owner of the banned account requests a review of their case using the Support Form. A petition or complaint will not help in a banning case, nor will getting friends of the player to plead on his or her behalf. It is not appropriate to post in the forum discussing bans. This page was last modified on 27 February 2019, at 17:25.